Aiko here is making the blog rounds this week, and one look at her will tell you why- she is damn cute! Cute, though, is just the door to this wonderful story. 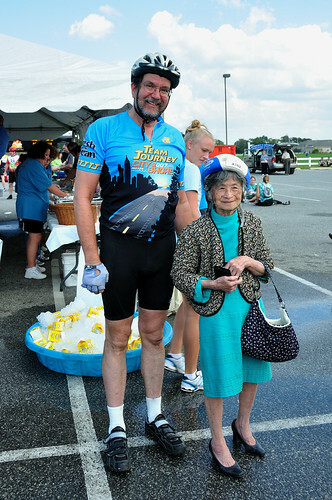 Aiko is 84 and rides the 150 miles of the 2 day City to Shore MS ride in New Jersey. She has done this every year for over 20 years. 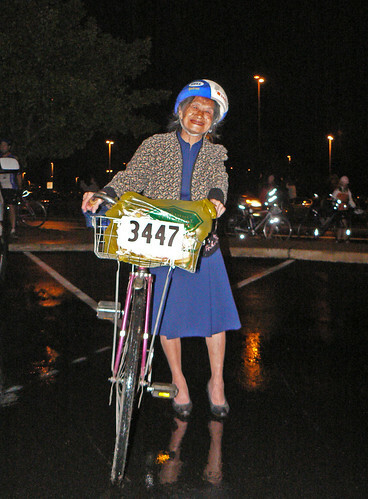 She rides a single speed bike, she wears the clothes she always wears (including her heels) and she rides the race with her family (including great-grandchildren!!) as a team. Aiko is a remarkable woman, to be sure. More than that, though, she is the benchmark of what we should all strive for. She is a woman without boundaries. With complete style, being only herself, she completes tasks that most of us think of as monumental but really only require a different point of view to be manageable. Through a simple, determined act, Aiko proves that the only things that hold us back are our own, self imposed mental limitations. Reading her story makes me want to ride. It makes me want to be better as a person. It also makes me want to start a purse and heels group to do some charity riding! Who wants to join me? From Flickr group member, Sweet Olive. It may be time to step it up, people! How good can you look on your bike? Saw this lovely memory from beers and my super babes. The frenchie and mixte friends Melyssa's and Adrienne's. 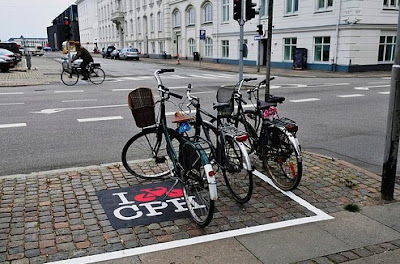 Of course CPH is flat. And mixtes look so much better in our crazy SF hills. Just sayin - /Love ♥m. 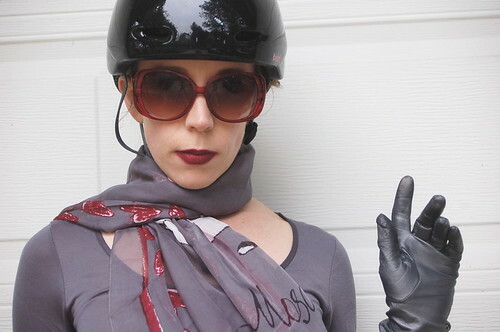 Over at Copenhagen Cycle Chic there is a discussion going on about an ad for Dior Perfume. 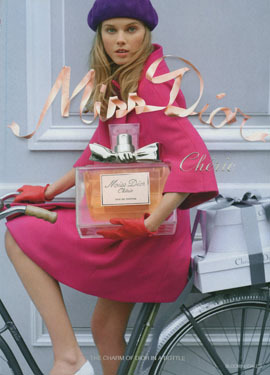 It depicts a young woman on a bicycle holding a very large bottle of perfume. One of the commentors to the post asked "Is it just me or is anyone else sick of cycling being the latest fashion trend?" 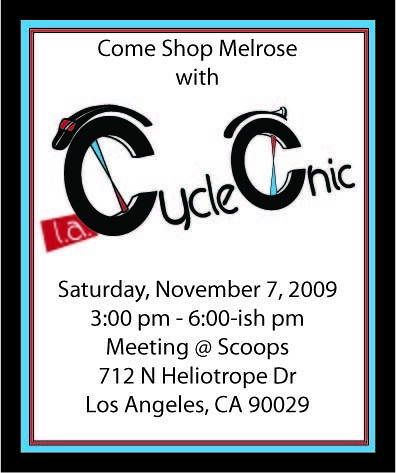 Come join LA Cycle Chic for a really relaxed ride to shopping on Melrose. 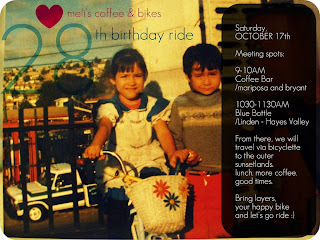 We'll meet at Scoops and people can get ice cream while they are getting ready to ride or if people prefer they can get ice cream after or not at all. Scoops is vegan friendly. Also Pure Luck vegan restaurant is right across the street in case people want to get dinner after. There are also plenty of places along the route if we need refreshment. The Metro Redline stops as Vermont & Santa Monica and it is a short ride from there to where we are meeting. Parking can be tricky in the area so plan to arrive early if you are driving. As a group we'll decide how much shopping we do. Dress should be chic. I hope you can make it. Edit: If you are planning on attending please sign up to follow us on Twitter that way we can tweet where we are and you can tweet us and everyone can K.I.T. That crazy rabble rouser from Copenhagen, Mikael Coleville-Andersen is going to be here in San Francisco. He will be giving a lunch time talk at SPUR, titled "Bike Like The Danes". The talk is open to the public (free to members, $5 for everyone else). 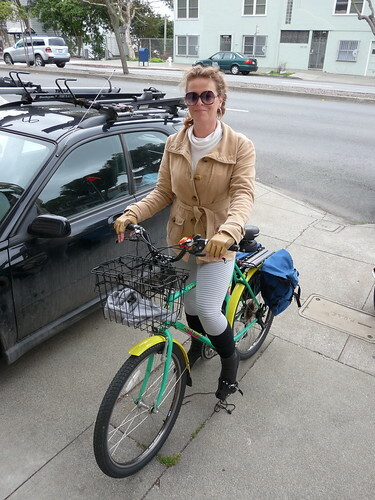 photo by Amsterdamize who needs to come to SF next! I will be in the audience hoping to get some tips on selling this lifestyle to the world. The more I ride and the more I write about it, the more I know in my bones that we need to get more people out of their cars. Not just for the planet, but for all of us as people. Tuesday Injection of Fun: Mischievousettes. Yeah. we are up to something. When aren't we?! I am a very loyal person. I have no problem holding on to something for a really long time while using it all the time. One of the things I have had, since the late 90's (my stepfather had it prior to that from 1988) is my old bike, Baby (named so because "nobody puts Baby in the corner"). 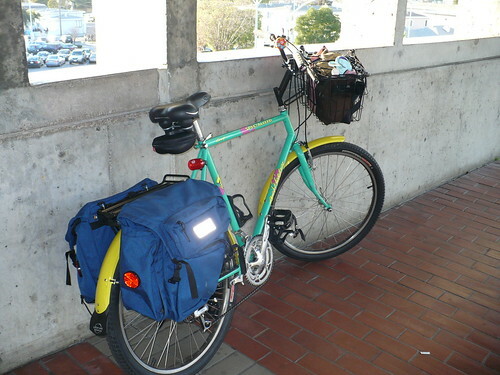 Baby is a 1987 Specialized Rockhopper Comp that has been modified to be a super comfortable commuter. She has been taken care of very well over her 22 years and is great to ride. The only reason I stopped riding her is because I needed a smaller frame (this one is extra large and just a tad too big for me at 6'). 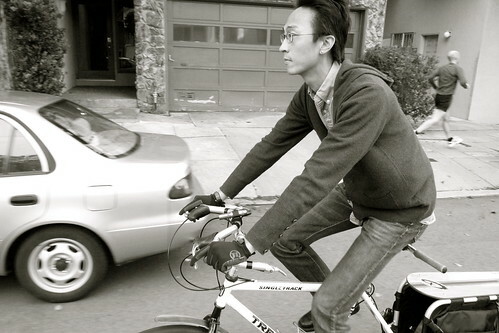 Even with the size issue, I have taken this bike all over the SF Bay Area over the years. 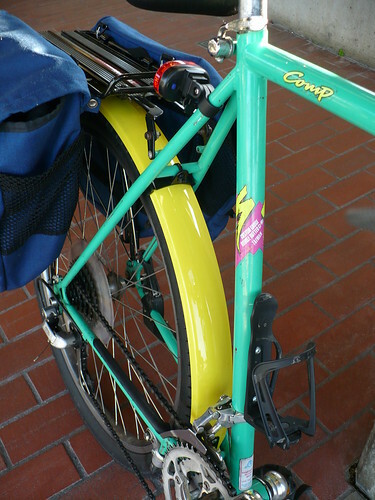 Baby's yellow fenders always make me happy! While I love talking about my bike, I have a purpose. Baby needs a home! While I will write up the details of this sometime this week, it comes down to this- I want Baby to go to a good home where she will be used and cared for. So here are the basics. 1) I will give Baby to the lucky recipient. If this person is not within easy delivery /pick up distance (50ish miles) we will have to work out shipping (which is not expensive). 2) She will come as is (she is 22 years old. She has been completely maintained, is solid and will come tuned and ready to go, but as with all older bikes, she is not perfect and has nicks and scratches and will most likely need some maintenance work in the not too distant future). 3) Baby will come with her lovely yellow fenders, her wonderful orange bell and a child safety seat (I will take pictures of the set up later this week so everyone can see what is really on offer here). 4) The idea is for Baby to go to someone who really wants to start a bike life, but for whatever reason, needs a bike and can not get one. This could be you, but I am really looking for someone who has been nominated by a friend. Do you know someone who needs a solid bike to get a kid around with? So there it is. Look for complete details later this week and start thinking about someone you know who could give Baby the home she deserves! Three thousand, four hundred and forty seven miles from October 14th, 2008 to October 14th 2009. That is how far I have got puttering around town, buying groceries and going to work. It wasn't a monumental effort. It was just daily life. It isn't the distance that is important. It was what I got out of those miles that counts- new friends, new opportunities, new strength, new life! Get out and ride my friends! You have nothing to lose and everything to gain. A parking problem that fits 12. 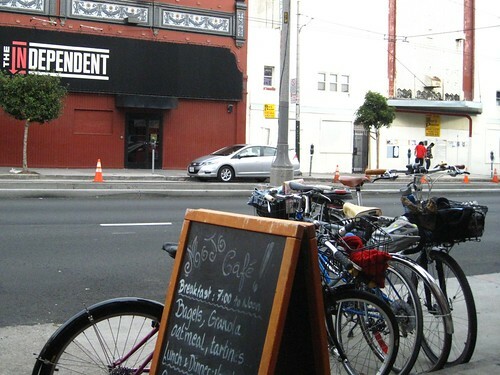 Parking is hard to find in the city, unless you are rolling to a coffee shop with us. Joe and the Mojo cafe crew. Always rad. Always fun. Who said parking in SF is hard? 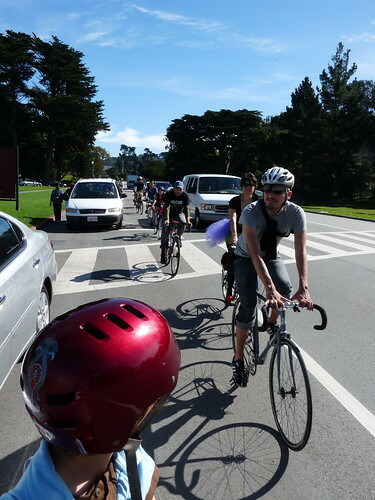 Unite Bike 2009: San Francisco! This is not directly bike related, but it is most certainly relevant (forget this is from VW. Pretend it is from Bianchi or something). 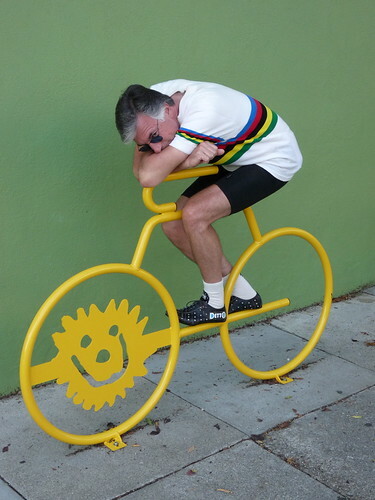 Some are uncomfortable with the silly side of cycling. They think it trivializes riders as over grown children. I am OK with being an overgrown child, because children know how to make things fun. If you can live in it, should we laugh it off? Why not make a ride sparkle? 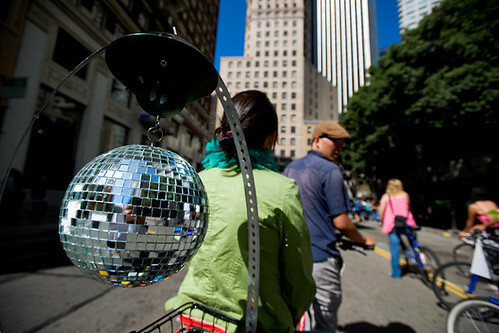 Is it any less a human powered machine because it has a disco ball? I think not! 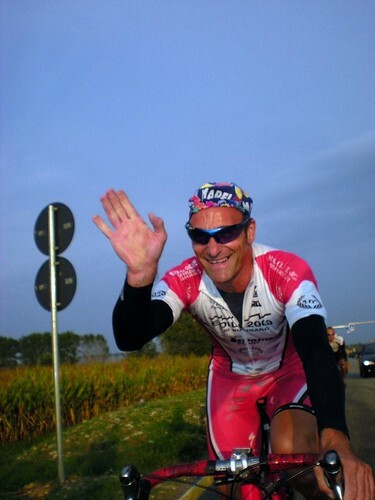 And when was the last time a smile and a wave from a man in pink spandex did not make you feel happy? 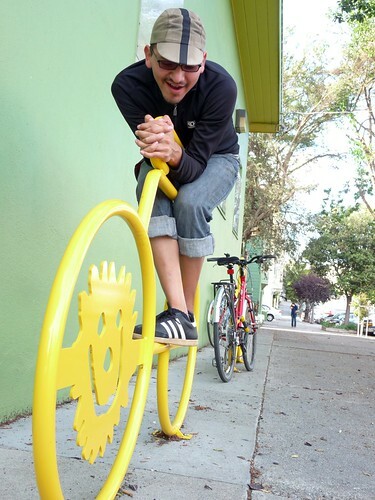 The fun factor- how do you find it on your bike? 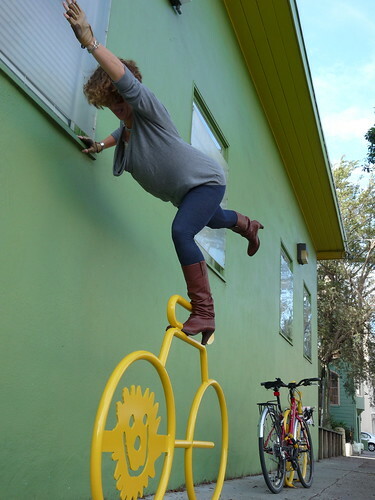 This lovely picture and story was sent into our Flickr group by "Cold Iron", a bicycle mechanic at Cycle City in Alameda, Ca. He sends in lots of pictures of his customers with their bikes. 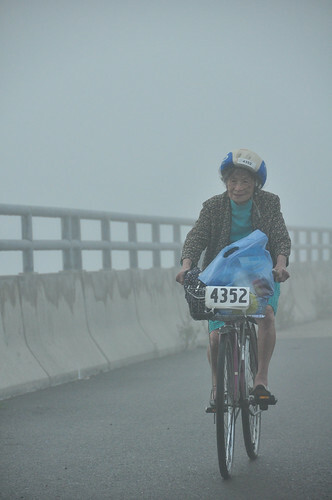 I like the stories he puts with the pictures because they show us all that a cyclist is just a person with a bike. This story, however, was super special to me. I just recently ended 12 years of working with Senior Citizens and this generation is, by far, my favorite. 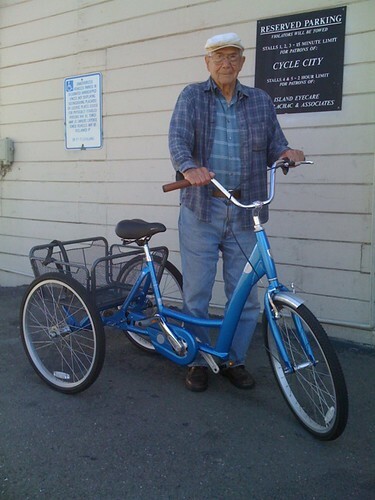 With a daily dwindling number of WW2 vets left, to see one out on a trike... makes my month! Mr. F was born in 1917. He's lived through 17 U.S. Presidents. He was 9 or 10 when Charles Lindbergh became the first man to fly across the Atlantic Ocean. He was 22 when the Nazis invaded Poland. He was 30 when the British left India. He was 39 (my current age) when Elvis made his television debut on the Milton Berle Show. He was 52 when Neil Armstrong became the first man to set foot on the moon. He was 64 when Iran freed the hostages from the American Embassy in Tehran. He was 73 when the Berlin Wall came down. He was 86 when the Centenial of Powered Flight was celebrated at Kitty Hawk. I am fascinated with the history of the 20th Century, and it's a real treat for me to know such a man. I think there is so much that can be learned from someone who's lived through so much change... and can keep a positive energy, and a fresh attitude... the way he has. I plan on riding well into ride into my 90's. When I grow up, I want to be just like Mr. F.
There are a million reasons why we ride. Maybe we ride so we can be the wind. 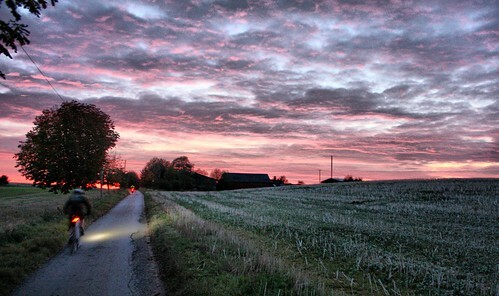 photo by Giorgio Vianini. Quick! Go look at his AMAZING photography! Why do you ride? What does it look like? Let us know! Tuesday Injection of Fun: Bike life is colorful!! Meligrosa is a year older, a year wiser, and now the proud owner of a purple tutu! A good day was had by all. 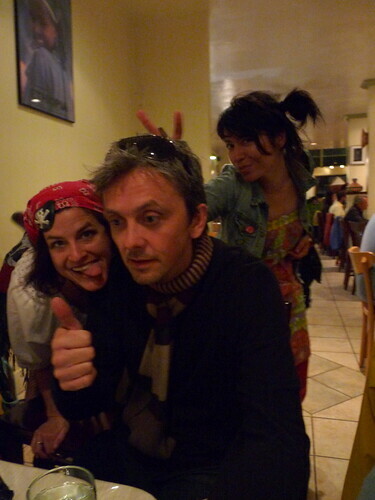 Of course, because it was Meli's birthday and we all love her! I will leave the rest of the story telling to Meli who hopefully has more pictures because very few of mine came out ! 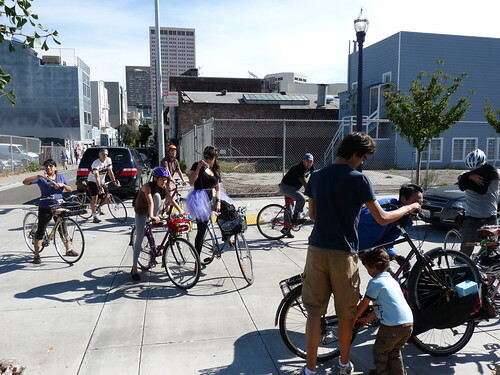 Some of San Francisco's most popular bicycle corridor is being completely torn up (to make it 50 times better!) but that does not mean that we have to be frumpy or frightened! We can let our beards free in the wind! In the City, we can take our curry for a ride knowing full well we will be followed and appreciated. Of course, a little walk through the city is a pleasant thing. 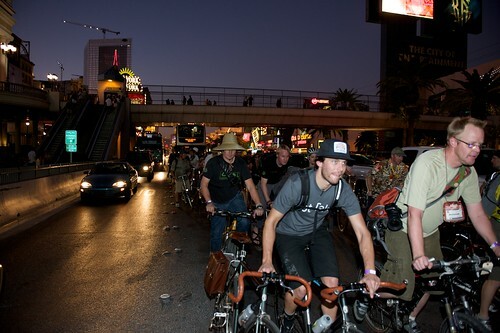 Maybe you feel like ghost riding a bike with a hundred of your friends? 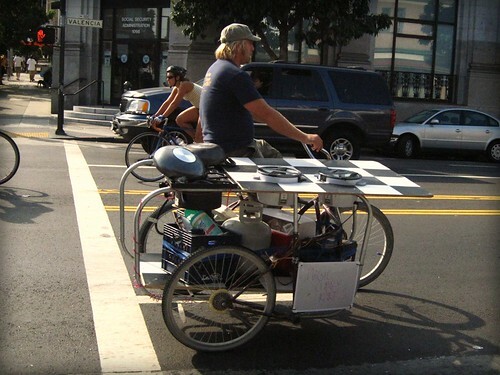 There are those urban cyclists that have things to take across town, so they do. The moral of the story? Get out on your bikes you Urbanites! 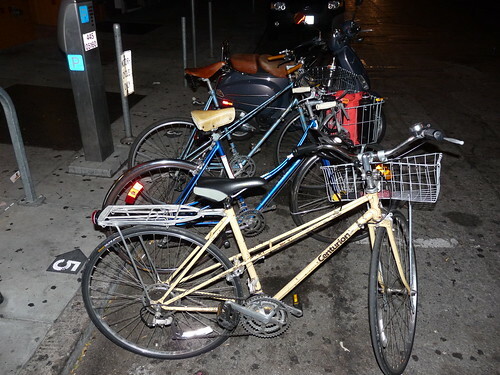 Bicyclists are becoming a force to reckon with. Car companies are making fun of us! When you discover you can not beat them, and before you join them, you tease them. Of course, they fail to understand that anyone who is contemplating bicycles for transportation is no longer interested in overpowered machines that can pass illegally while speeding on blind curves. They also seem to think that those of us who do ride for transportation are not capable of riding to work in the rain in proper rain attire or in a straight line. Aahhh, advertising- hoping you are too stupid to know when your intelligence is being insulted. Give me more. Fog, cement and readings. Today when I got home from work I fed my cat and headed back downstairs to grab my frenchie. Out Out is all I could think. Riding around the city is all I can think about when I'm at work. Like the city skyline is calling my name and pulls me by a rope to join the masochist society and ride those hills up, down, back around. The structure of the streets, tunnels, bridges and hills spin my personal perspective widening it every year . As I become a wiser cyclist (you can never be so used to hills, you know..) and an even bigger wanderluster, my focus this month is cement. Cement on bridges, cement and pavement smoothly re-done on bike lanes - or lack thereof, oil spills, smooth sidewalks for pedestrians and the inevitable steep hills with all the fall leaves colorfully soothing the eyes with that brownish red taste that looks so rad in contrast with the fog. I look over the north-east end of the city and the fog is wait, that isn't fog, that is a steam-like cloud sitting atop the bay water. Ladies and gentleman, we are now floating in space. •Removing Freeways - Restoring Cities. The bicycle, and cities, and we, as residents of the world. It is something that we are all already contributing to, step by step, towards a better end. That is a good step forward. Climate change. It blows. I should be able to write something more intelligent about it, but the fact is I can't. What we are experiencing right now is the result of a 100 years of expanding population, expanding economies, expanding technology.... and after all expansion comes retraction. This is what I see as "climate change". Nature is pulling us back because we have not pulled ourselves. What does this have to do with bicycles? 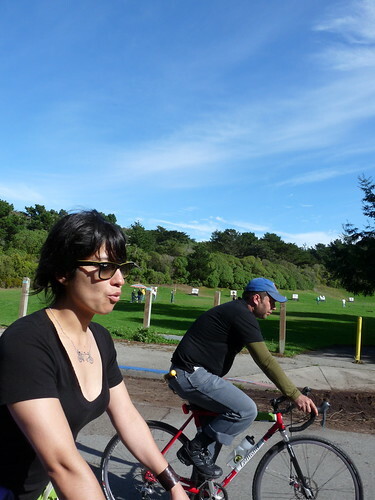 It is easy to see that riding a bicycle is good, and others have done a great job pointing that out. I am afraid that I am a bit more... pessimistic about it. To me, I think that we better get used to it now, 'cause in another 20 years, there will be many, many fewer options for us when it comes to how to get around. I write this because it is Blog Action Day and bloggers across the globe are being asked to blog about climate change today (and because I am a hopeless joiner from the looks of it). The hope is for a larger, global conversation to come out of it. A laudable goal, to be sure. 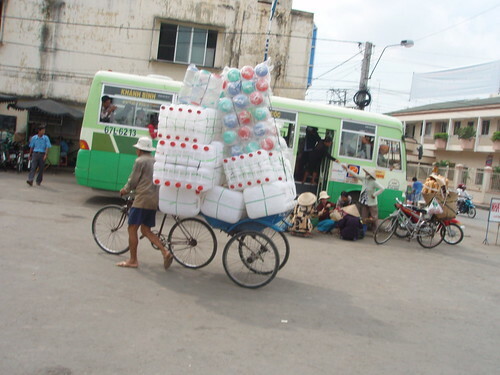 For myself, I am not sure that the challenge of tackling global climate change is how I want to look at bicycling. It is too large an issue for an individual to tackle. I prefer to look at cycling as a means of changing my own, personal climate- how I feel in my own body, how I improve my own life. 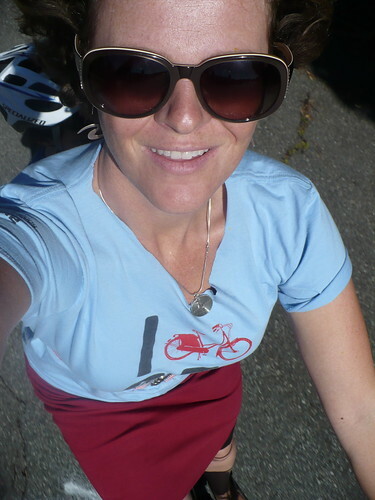 The only thing we can change is ourselves, and one of the tools I use in that pursuit is my bicycle (and blogging). While my riding may or may not make a difference to the globe, it makes a difference to me. Hopefully, along the way, it makes a difference to someone else. Sorry I can't contribute a more rah-rah POV, but there it is. Addendum- I find it interesting that when looking at registering the blog at the Blog Action Day website, I was asked to choose from a list of possible blog topics- Iraq, celebrity, cars, blogging, social media, Mommy & Me, "green"..... there was nothing for bikes or transportation or New Urbanism. Seems a bit strange to me considering the topic. 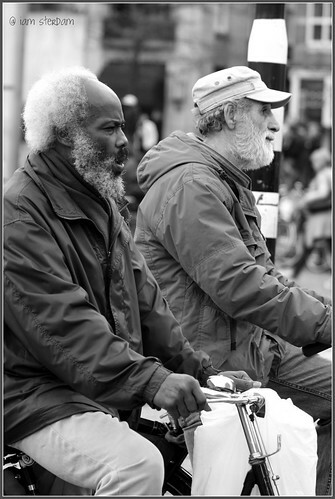 Bike Culture. Yay Or Ney? I have a family blog that does not get updated enough these days. With three kids, James and I are usually pretty busy, so writing can get shoved to the side. 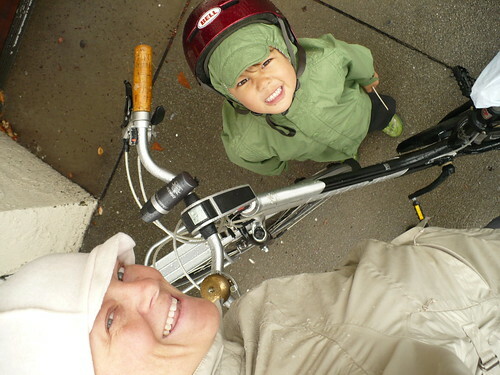 Today I was looking for a picture I knew was on the family blog when I ran across this post from my Hubby the Bike Man. I didn't realize he had posted it (I haven't even looked at the family blog for months!). While discussing the topic of American bike culture with our new found friend Geoff, he explained how no such thing existed while he lived in Amsterdam. How can that be? 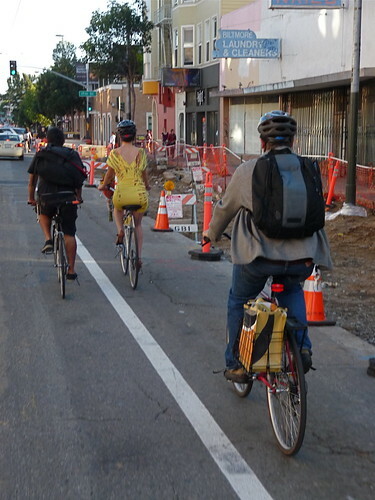 How can the city where bikes have the privilege of having roads made specifically for them, where every one rides a bicycle, have no bike culture. Further discussion on the matter lead to some enlightening conclusions that come at you like a bus full of Vegas bound retirees. And it seemed so obvious in hind sight, in a way not so unlike the cartoon light bulb going off. 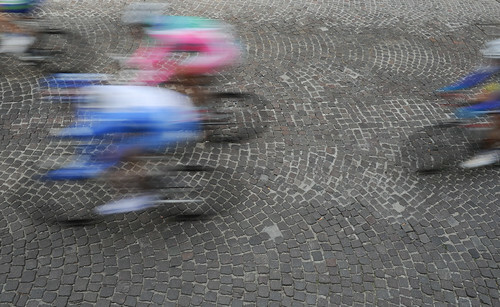 The discussion started with a simple question not unfamiliar to American cyclists: "What kind of cyclist are you?". Most American cyclist will have a natural answer at the ready. The terms "weekend warrior", "roadie", "mountain biker", "downhiller", "BMXer" come to mind. Yet that very same question would perplex someone from Amsterdam. The bicycle is so ingrained into the every life of the Amsterdamer, that they no longer think of it as a facet of their lives. Suppose I posed to you this multiple choice question: "What kind of driver are you? ", with the available answers as "off roader", "race weenie", "mileage counter", etc. It would seem rather absurd wouldn't it? 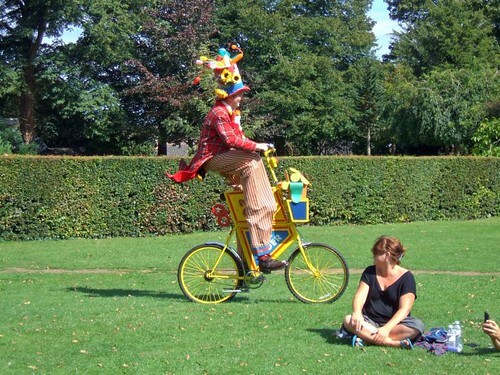 The bicycle is such a large part of the average Amsterdamer's life, just like the automobile is a part of the average American life, that the very idea of "bike culture" just doesn't make sense to them. It's just part of their culture, much the same as American culture is car-centric. 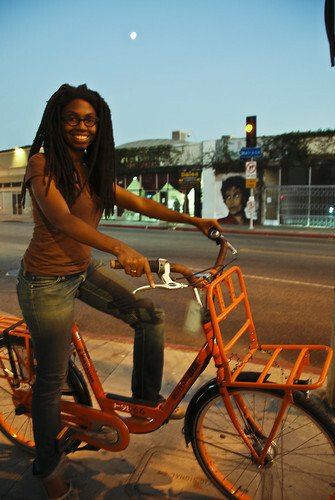 So to have Americans integrate bicycles into their lives, all we need to do is rid ourselves of bike culture, right? Until then... Down with bike culture. Long live the bike. So, what do you think? 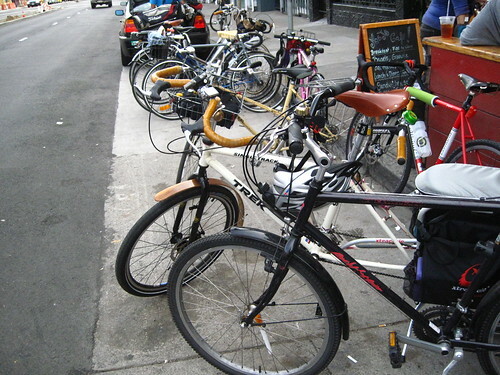 Do we need to eliminate "bike culture" or do we need to make it so ubiquitous as to make it unnoticeable? Declan Says "Let It Rain!" If you watch the news, you know San Francisco (and most of the rest of California) is being hit by the remnants of a typhoon. By 1 pm today, San Francisco has received a little over 2 inches of rain!!! With winds up to 60 MPH and my neighbor building an arc, what do I do? Go for a ride with Declan! 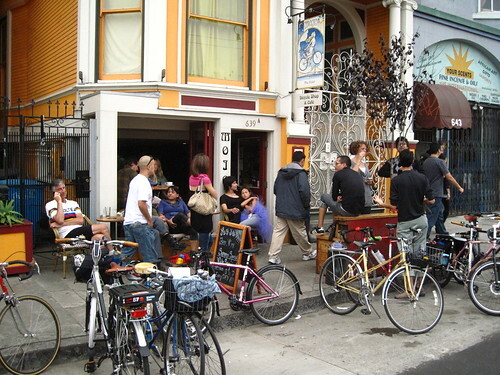 There was enough of a break in the wind to make riding down to the next neighborhood for coffee doable. 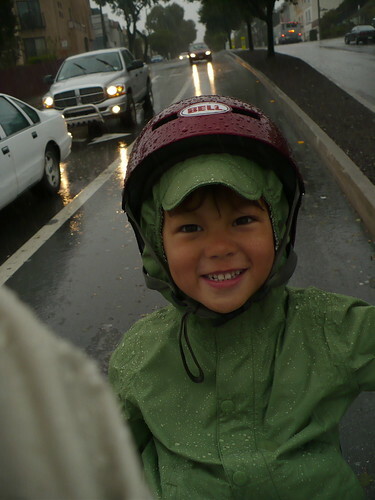 Declan got new rain gear just for riding and we wanted to test it out. I thought he would be miserable back there in the rain. I was wrong! He loved it! At least I know he won't whine the whole way home from school tomorrow. One can hope! Check out our friends photos!